Colour has become an indisputable cornerstone of menswear over the last couple of seasons, and I think we can all agree that the modern man’s wardrobe has done nothing but benefit. Whether you’re cracking out some vibrant socks, working the pastels or making a bold statement, colour is fantastic. Now, I am fully aware that coloured trainers might not be everyone’s cup of tea; smarter, more structured dressing is certainly the general theme, and whilst there is absolutely nothing wrong with this, it is still important for us all to remember that not everyone is the same – we do not all dress the same and we do not always appreciate the same styles. I know I bang on about versatility and new ideas like there is no tomorrow, but I would rather the fashionable versatility and new ideas of everyone could be appreciated just as much as having a signature style and set formula. As a group of style conscious men, we should be able to appreciate elements of all style, of every individual’s style (within reason of course). We are all unique and I don’t think anyone could disagree with the idea that we all need a little boundary pushing every so often to get us out of our comfort zone. And one brand that always promises to take us out of that comfort zone is Adidas. 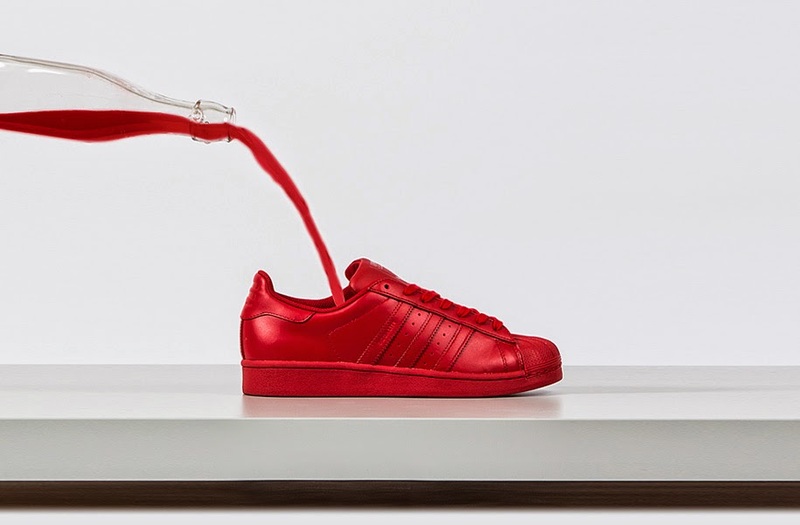 Adidas Superstar lace-ups have long been an essential part of any trainer fans arsenal, but have recently become a must-have among the fashion pack too. From fashion editors to celebs like Rita Ora, every stylist worth their salt has invested in a pair of shell-toes. This season though, there’s a new style to know. Pharell and adidas Originals continue their ongoing partnership with the mega release of the adidas Superstar “Supercolor” pack. 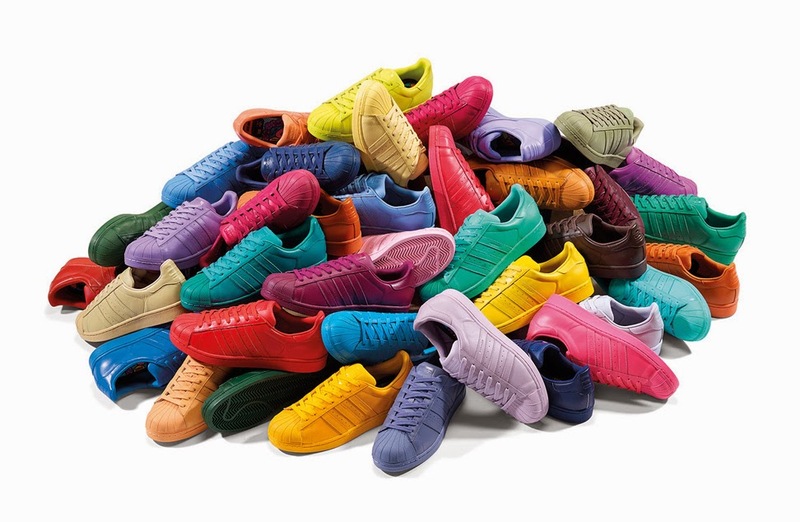 With more colors than a bag of Skittles and M&M’s combined, Pharrell presents the Superstar draped in an unprecedented fifty colorways, each in monotone versions in every hue of the rainbow—and then some. 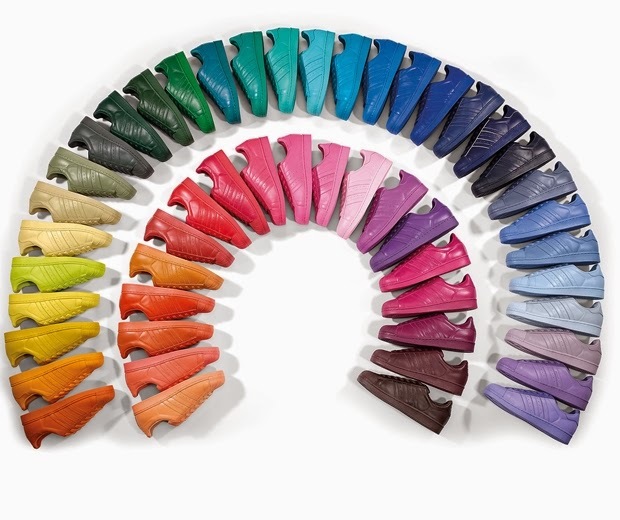 Having been released yesterday, which colour would you go for on the equality marked shoe? I will admit, when the lines started to come in the delivery at work I was not crazy about it but I think the superstars will be an even bigger hit this coming season and I will probably be investing in a pair. From boyfriend jeans to leather pencil skirts and supersized culottes, there’s not a lot you won’t wear them with this season. And we’d say that’s definitely something to be happy about.